Is there a wildcat on the loose? We kept a couple of mature hens in a extra large dog crate with re- bar offering a variety of perches. These sit along side the chicken tractors. The purpose is to allow me to easily and reliably observe and weigh the same chicken without locating in a larger flock. These birds are now mature and weigh over 6lbs. One morning I approached and found the bars of the crate bent and a small handful of feathers. Clearly we had another predator. Thus we set up the game cameras. After reviewing hundreds of boring frames, we were suddenly struck by a couple of them. The fence is electric mesh from Premium 1. It checks out at around 6,000v output. In series of frames showed possum scuttling about outside the fence, approaching the fence, and running away from the fence. So clearly the fence is good. But we have loss from inside the fence which was undamaged. 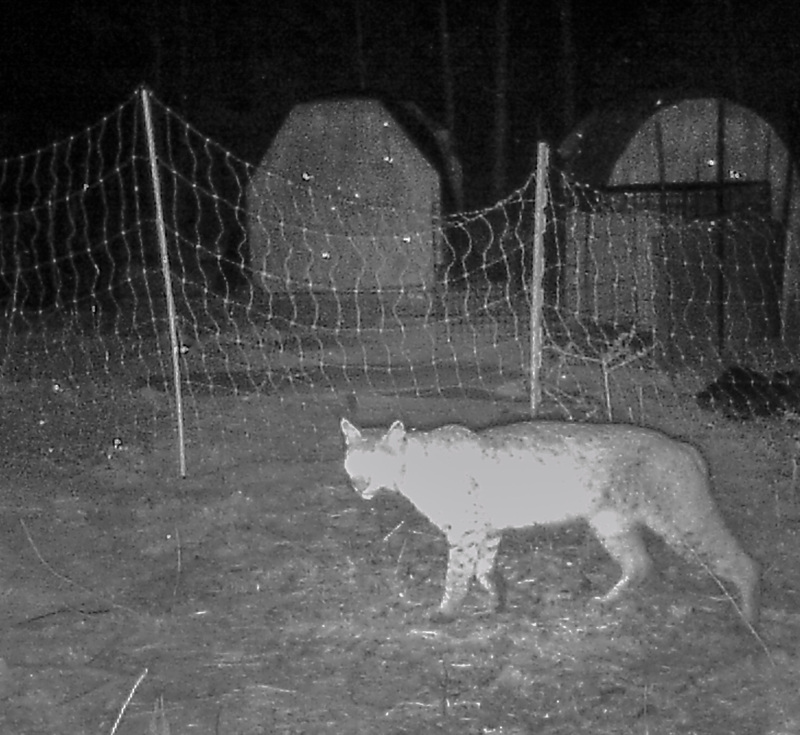 This wildcat seems to be getting over the fence. 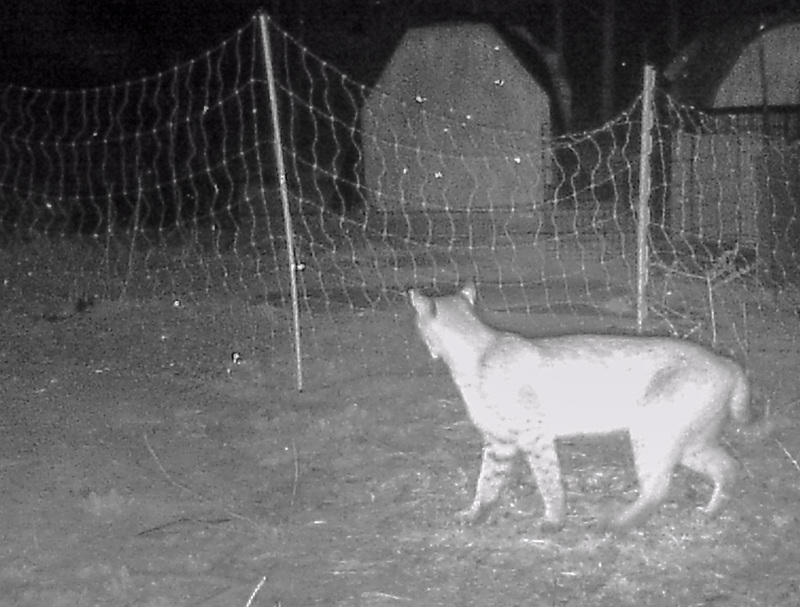 The camera was up a week and only showed the wildcat on 1 night, approximately 02:30. Losses of free roaming guinea hens have been approximately 1 per week which indicates an animal with a decent size territory. So far there is no sign the main chicken tractors have been messed with, but given the damage to the dog training crate, the chicken tractors are unlikely to keep him out if he feels like chicken. 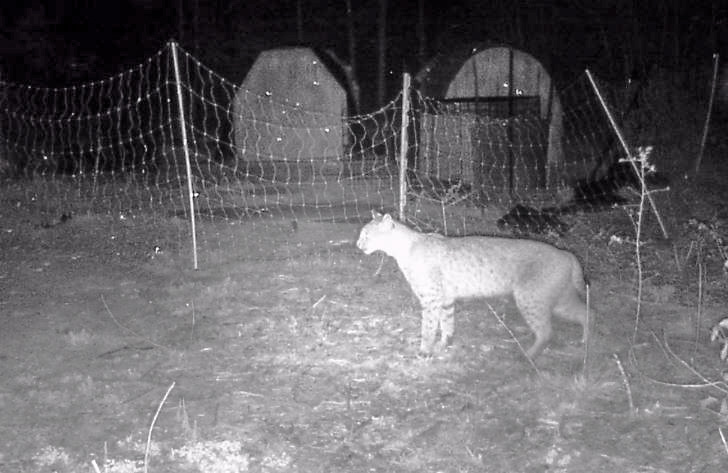 Currently the game cams are up again to try and further understand the patterns and timings of the big cat / wildcat / bobcat / other. As many neighbors as possible have been warned. Goats and the like may be vulnerable to such a wildcat. Our hope is that is passing through and will move on, but that may be just too hopeful. A wildcat in the chicken tractors could be expensive.